Have you heard about Facebook Instant Articles? 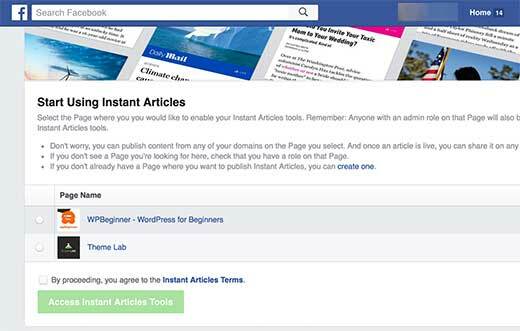 Want to add Facebook Instant Articles on your WordPress site? In this step by step tutorial, we will explain what are the pros and cons of Facebook Instant Articles as well as show you how to easily setup Facebook Instant Articles for WordPress. Instant Articles is a Facebook feature which allows you to load your content 10 times faster by using a customized mobile format. It is based on the same technology used in Facebook apps for mobile devices. Instant Articles load up to 10 times faster than a normal web page. This incredible boost in speed provides a better user experience for mobile users. Many popular media sites like BuzzFeed, TechCrunch, Mashable, and countless others are using it on their websites. You can easily spot instant articles in your Facebook feed by the lightning bolt icon. Like everything else, there are some advantages and disadvantages of using instant articles on your website. Faster load time means significant improvement in user experience. Due to speed, users are more likely to share your content. Access to monetization options through Facebook Audience Network. Facebook’s massive user base can bring new wave of traffic to your site. Users will not see your sidebars. It will hide your useful widgets, email list forms, and everything else that is not part of the article. You may witness a drop in advertising revenue, as Facebook instant articles limits the advertisers as well as the number of ads you can show on an article. You can use some images and videos on your article, but Facebook instant articles will limit that as well. Most shortcodes, custom fields, and other WordPress features will not be displayed in your articles. Considering the pros and cons of using Facebook Instant Articles, it is a mix bag for publishers. It actually depends on the type of content you produce and your business goals. If you’re a news media site, then it makes sense for you to add it. If you’re a business website, then it may not be a huge difference maker. 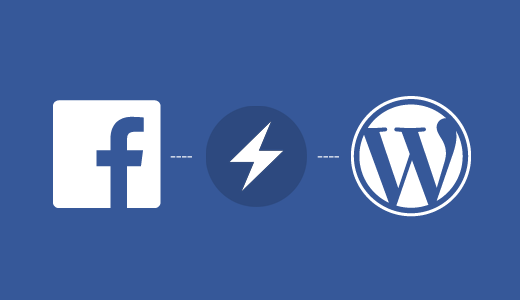 What Do You Need to Enable Facebook Instant Articles in WordPress? Facebook page for your WordPress website. Facebook page app (we will show you how to create it later in this article). At least 10 or more articles on your website. Instant Articles for WP plugin (We will show you how to set it up later in this article). Having said that, let’s get started by applying for Facebook Instant Articles. 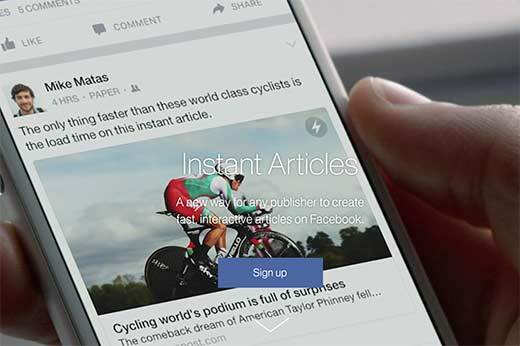 First you need to visit Facebook Instant Articles website and click on the sign up button to get started. 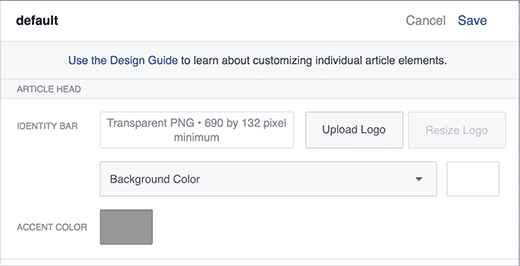 Facebook will now ask you to select a page. Here you need to select the Facebook Page for your website. After that check the box to agree with Instant Articles terms and then click on ‘Access Instant Articles Tools’ button. 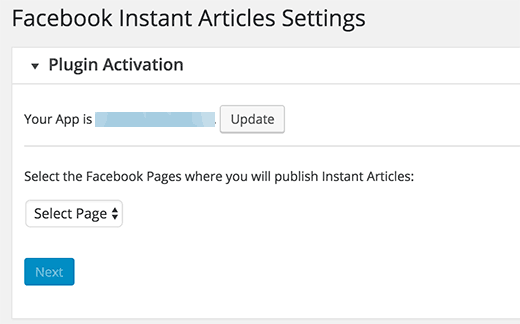 This will take you to the publisher tools on your Facebook page, which will now have an instant articles section. First, you need to prove the ownership of your website by claiming your URL. Scroll down a little to the Tools section on the page and click on the ‘Claim your URL’ to expand it. Facebook will show you a code snippet. You need to copy the code and insert it into the <head> section of your WordPress site. There are two ways you can add this code to your website. You can edit the header.php file in your child theme and paste the code just before <head> tag. But if you are not using a child theme, then you can use Insert Headers and Footers plugin. For more details, see our step by step guide on how to install a WordPress plugin. 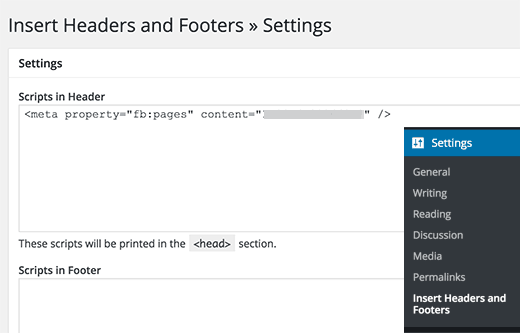 After activating the plugin, go to Settings » Insert Headers and Footers page and paste the code into the header section. Click on save button to store your changes. 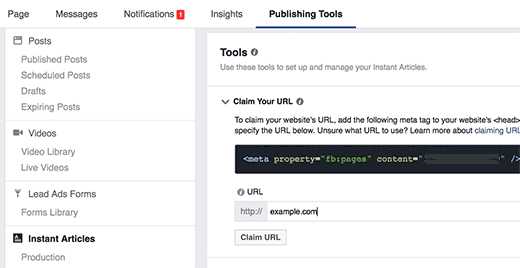 Once you have added the code to your website, you need to switch back to the publisher tools section of your Facebook page. Add your website URL below the code you copied earlier and then click on the claim URL button. 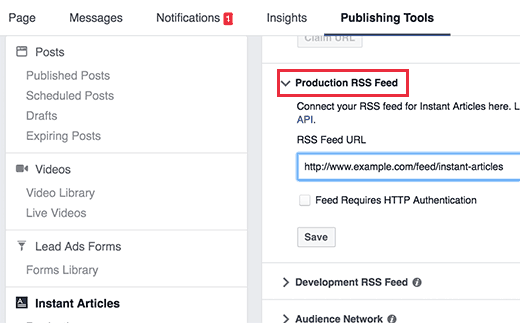 The next step is to add an Instant Articles RSS feed for your website. Here is how you can generate an Instant Article feed for your WordPress site. 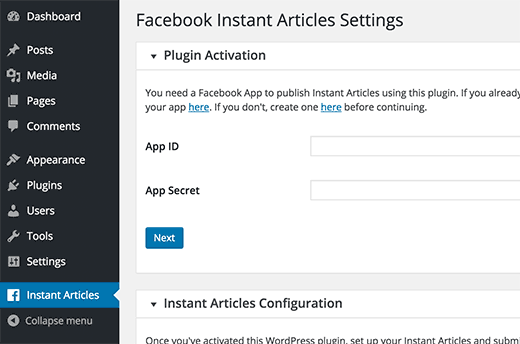 Simply install and activate the Instant Articles for WP plugin. Upon activation, the plugin will generate an instant articles feed for your WordPress site. 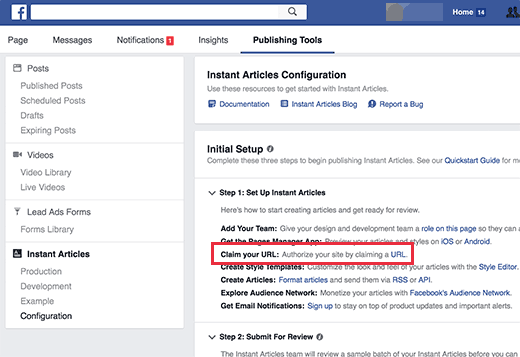 Copy your instant articles feed URL and switch back to your Facebook page’s publishing tool section. Scroll down to the Tools section and click on ‘Production RSS Feed’ to expand it. Paste your Instant Articles feed URL and click on the save button. Facebook will show you a success message that your feed is added. In the previous step we installed Instant Articles for WP plugin to generate RSS feed for instant articles. Now you need to set up rest of the plugin settings. You will notice that upon activation the plugin added a new menu item in your WordPress admin bar labeled ‘Instant Articles’. Clicking on it will take you to the plugin’s settings page. This plugin requires an App ID and Secret keys for activation. You will need to create a Facebook app for your page to get those keys. Let’s take a look at how you can do that. First, you need to visit the Facebook for Developers website. Click on the drop down menu next to My Apps menu on the upper right corner of the screen next to your profile photo. This will bring up a popup on screen. You need to click on website. This will take you to a quick setup wizard. You need to enter a name for your Facebook app. This could be anything that helps you identify the app. 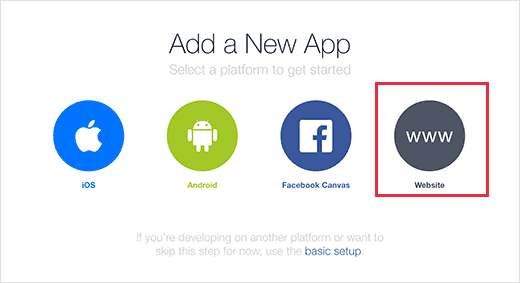 Click on the ‘Create New Facebook App ID’ button to continue. A new popup will appear asking you to provide a contact email address and select a category for your app. Enter an email address and select Apps for Pages as app category. Click on create App ID button to continue. The popup will disappear and Facebook will now create an app for you. On the quick start page, you will see new information about how to use the app. You just need to scroll down a little to ‘Tell us about your website’ section. Enter your WordPress website address here and click on the next button to continue. Even though Facebook will be showing you that there are more steps in the set up wizard, but that’s all the information you needed to enter. 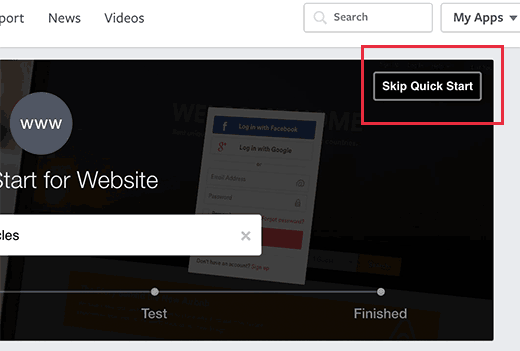 You can now click on the ‘Skip Quick Start’ button at the top right corner of the page. You will be redirected to your newly created app’s dashboard. You will be able to see your App ID and to see your App secret key you will need to click on ‘Show’ button. Before you copy these keys, first you need to make your app live and publicly available. Click on the ‘App Review’ link from the menu on your left. On the next screen, you will see that your app is under development mode. Click on the toggle to switch it to ‘Yes’ and make your app live. Now click on the dashboard link from the left hand column to go back to your app’s dashboard. Copy your App ID and Secret keys. 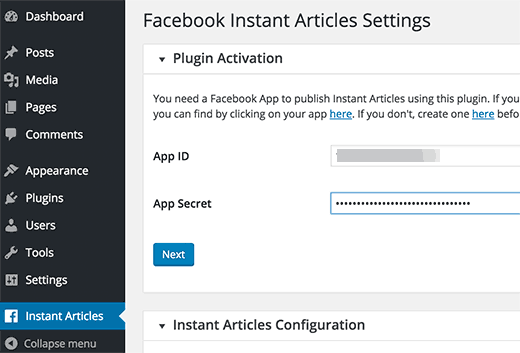 Return to your Instant Articles for WP plugin’ settings page on your WordPress site and paste your App ID and Secret keys there. The plugin’s settings page will now show you a login with Facebook button. This will take you to Facebook, and you will be asked to give the app permission to access your profile information. After giving permissions, you will be redirected back to your WordPress site. Click on the ‘Select Page’ drop down menu to select your Facebook page. Your WordPress site is now ready for Instant Articles. There are still two more steps left. Visit your Facebook page and from the admin bar and click on Publishing Tools. From your left hand menu, click on ‘Configuration’ under Instant Articles. Scroll down to the Tools section and then click on the Style tab to expand it. 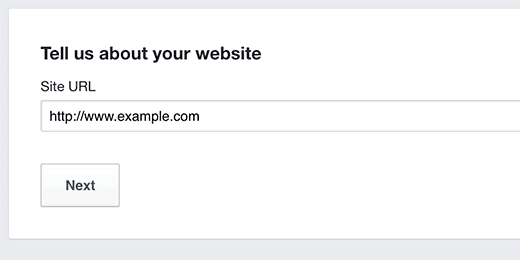 Facebook has already added a default style for your website. Click on the default style to customize it. This will open up a popup where you can upload your website logo. Facebook requires images that are 690 by 132 pixel minimum. After uploading the logo, click on Save and then click on Done. 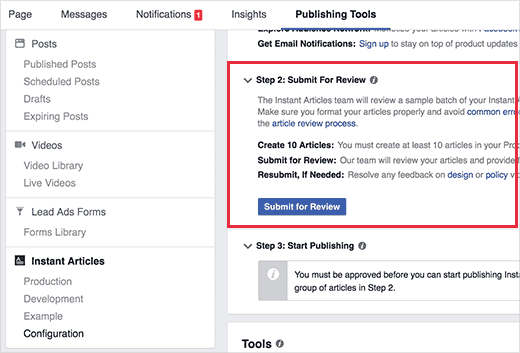 Before you can submit your Instant Articles feed for review, you need to make sure that you have at least 10 articles in your Instant Articles feed. If you have already published more than 10 articles on your website, but the feed is not showing all of them, then you need to edit your last 10 articles and simply click on the update button. Once you are sure that you have 10 articles in your Instant Articles feed, you are now ready to submit it to Facebook for review. Go to your Facebook page and click on Publishing Tools from the admin bar. After that click on the ‘Configuration’ link under Instant Articles on your left hand menu. Look for ‘Step 2: Submit For Review’ on the configuration settings page. If there are no errors with your Instant Articles feed, then you will see a ‘Submit for Review’ button. Go ahead and click on this button to send your feed for review. That’s all, Instant Articles will become available for your website once Facebook team has reviewed and approved your feed. Facebook requires that your Instant Articles feed match specifications described on their developer website. Instant Articles for WP plugin handles that part for you. However depending on the theme or plugins you are using on your site, you might see some errors or warnings. 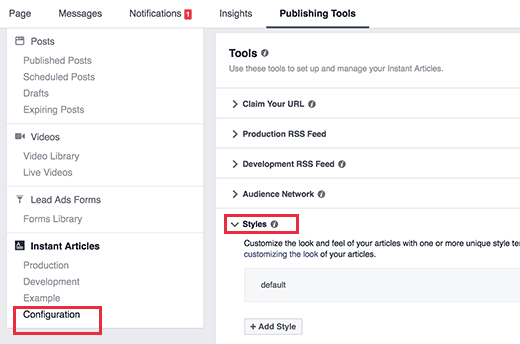 An easier way to troubleshoot those errors is by editing a post and scrolling down to the Facebook Instant Articles meta box below the post editor. 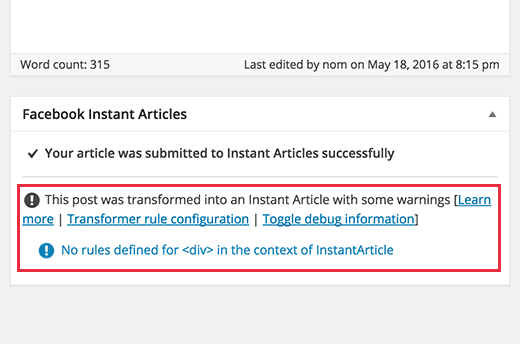 Most of the errors are caused by plugins or theme adding content into your posts that is not supported by transformer rules used by Instant Articles for WP plugin. You can create your own custom transformer rules. Refer to the plugin’s documentation to learn how to add your custom transformer rules. However, we feel that it would be difficult for most beginners to do that on their own, so you may need a developer. You can try to configure your other plugins and themes and stop them from adding content blocks into your posts. If you are continuously getting Empty Feed error when submitting your Instant Articles feed, then check the URL you are trying to add. These are two different URLs, and depending on your WordPress setup, entering the incorrect URL may result into a 404 error. If you are still seeing the empty feed error, then try updating the last ten posts on your site. This will change their time modified and will add them to the feed. 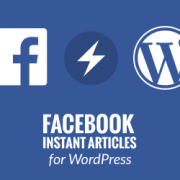 We hope this article helped you set up Facebook Instant Articles for WordPress. You may also want to see our list of 40 useful tools to manage and grow your WordPress blog. I have created a website recently. it’s just been 20 days. And also i have created a Facebook page 4 days ago. my website has around 13 posts and on facebook page i have published 2 posts. So is it something like that my facebook page should be 90 days old so that my page can be eligible for Facebook instant.? for instant article which hosting plan i should purchase? You do not need a specific hosting plan for Facebook Instant articles, for this method you would just want to be sure your site is a WordPress.org site. So it’s just like Google AMP but a Facebook version of it. Right? This post really inspired for me . Therefore, try it especially if you want to increase traffic to your site. Take advantage of Facebook’s massive user-base to share your work. The provided URL is not being accepted because the site has minimal readership, which violates the Instant Article Policies. Please provide a different URL. this error show for my website. in my website 80+ article post. please tell me what to do. Get more traffic in your website and then try again and make sure you put the metatag properly in header.php in your website. please how can i use my existing Facebook page to register for Facebook instant articles? Most of the stuff is still accurate and applicable. You should have no problem following it. The only difference is that you no longer need to create a Facebook Developer App to do it. Essentially, Facebook made it easier. Thanks. I was looking in google about fb instant articles and also tweeted. But I dont think this will give more traffic to blog. thanks for such a good post i have successfully setup the instant article.But i am getting a problem that my posts don’t show images on instant article and some post don’t show ads. This is great, but it doesn’t tell us how to get the ads activated. Hello, I have problem. When I try to activate Word press Instant Article plugin I see this: “No space left on device (28) in Unknown on line 0 Warning: Unknown: Failed to write session data (files). Please verify that the current setting of session.save_path is correct (/var/lib/php/session) in Unknown on line 0” ? whenever i try to claim my url, it shows something like this. please tell me what to do now. Please help. It seems the Instant Article plugin for WP has been updated and I was unable to follow your tutorial to set up the Plugin on my WordPress dashboard as the setting page looks totally diferent from what you showed on your images. Ad size and lots more things..
and when along with this error when i am entering that feed url then in result that url is showing full coding in result..
when installing the plugin, it gives me this error! Please see our WordPress troubleshooting guide or try plugin’s support forum. in settings under the dashboard tab? greetings… WPBEGINNER SUPPORT, i appreciate this post.. very educative. i was able to submit for review following your steps. please i need help on the instant article plugin for wp, i could not submit for review, when ever i try submitting, i always get ” Permission Error”. i wish to know if that will also be needed after the review from facebook team? Thank you very much……….. you are so kind. Some of the permissions below have not been approved for use by Facebook. Can we add images in the instant article? Hi, I use an advertising script I have inserted in the dedicated section of the wordpress plugin code . The posts that are published show instead of advertising a blank, why? how to install instant articles for wordpress.com not self-hosting? First of all, thanks for this article! Try updating your permalink structure. Simply visit Settings » Permalinks and then click on the save changes button without changing anything. I went to my Facebook Page > Publishing Tools > Published Posts at the top of the sidebar. From there, I located my most recently shared blog post and clicked on it to open the Post Details box. That was the thing that made it all work. Hi Admin. Thanks for nice step-by-step tutorial. I just want to ask, how to add related articles at the bottom of instant articles. it is automatically show only for visitor or need some code to make them appear?. Thanks. Thanks for this great post. I followed your steps and i managed to set it up on my fb page. But I have a problem. I have customize the styles in with facebook style editor and everything was okay when I review it with fb pages apps. But the problem is, when i share the articles, the published post used ‘default’ style instead of the other one. Please help me. We have automatically detected one or more common errors that need to be fixed before you can submit for review. All articles must include a logo, which you can upload in the Style Editor. Fantastic Article. Could not have made without you. Thank you. why my images not loading on my instant article ? No matter what changes I make, I cannot submit articles.There has to be a better plugin than this one. It;s always buggy or not compatible with “this version of WordPress” I got it right the first time with a client;s site, but after I cannot publish any other new articles. Tried to set up my site, I can’t submit articles at all. Hi, I am running multiple lingual website. 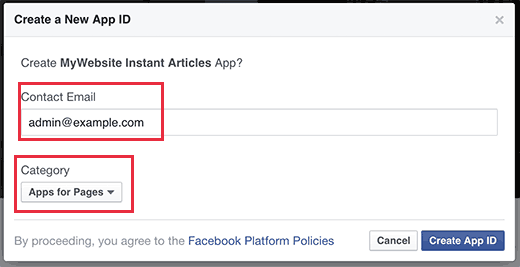 I want to run the instant article both of the above domains. How is it possible? Do I need to merge two rss feeds. Need your suggestion. Great and detailed guide on Facebook InstantArticle. “no rules defined for in the context of InstantArticle”. Sir how to fix this problem. Please help me. my URL for Rss Feed is 404 Not Found How to fix??? What is the URL of your Instant Articles RSS feed? All the links that I share are being converted into instant articles. I want only selective articles to be published as instant articles. I use affilate links in some posts which dont wirk in instant articles. Please help! 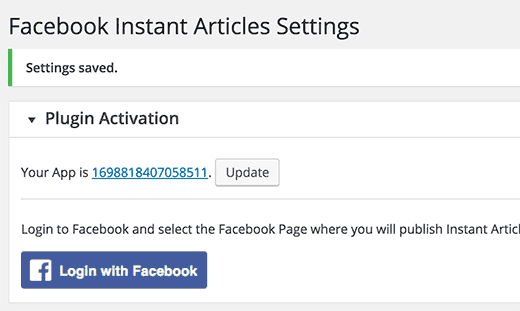 Log in with Facebook to finish connecting the Instant Articles Plugin to your account. This is by far the most useful resource I’ve found for adding FB Instant Articles. One question, do you have a tutorial for excluding certain post categories from your Instant Articles feed? HI. I’m using wordpress.com. How do I setup FB instant articles? Hi Geri, please see our guide on the difference between self hosted WordPress.org vs free WordPress.com blog. How can i go over this thks. You can check what causes this issue if you look at Instant Articles settings on Facebook. For me, the page logo was missing. Once I uploaded that, the Permissions Error went away. I’ve just been approved for Facebook Instant Articles. I’m using the “Instant Articles for FB” Plugin to publish my Instant Articles. I just published blog Post and it shows up as Live in Instant Articles. How do I get the Instant Articles link? I don’t see it anywhere and I don’t have any idea how to access it. Any help you can provide would be appreciated. i like instant article which is more similar to GOOGLE AMP pages. You just saved my day. Indeed a great help. Thank you so much. Hi and thanks for the post. I keep on getting doubles to my production feed? Any idea how to prevent this? Get 15% OFF on ThirstyAffiliates WordPress affiliate link management plugin. Get 30% OFF on Media Maestro WordPress media content management plugin.